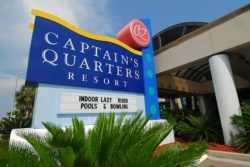 You’re tired, the kids are hungry and you’ve just driven countless hours to get to Captain’s Quarters Resort in Myrtle Beach. Having some tips for a smooth check-in will help you and your family get to your room faster and get your vacation started on the right foot. The quicker you get checked in the quicker you and your family can start relaxing and having fun. We have limited short-term parking in front of our lobby. If there is a spot available, feel free to park there while you check-in. Otherwise, you can park in the garage while we get you checked-in. Depending on where your room is located, you may move your vehicle after check-in to a more convenient parking deck floor. Our lobby does have restrooms if your family needs a bathroom break while you get your key cards and resort information. It’s best to wait until you find out where your room is before you begin to unload your luggage. You likely will enter the property from the parking garage once your room is assigned, as opposed to the lobby, although this may depend on where your room is located. Be sure you know your license plate number (or have it written down); you will need it at check-in when you purchase your parking pass. You will need to present the credit card used for the deposit on your room along with matching photo ID. If you will not be paying with the same credit card you used for your deposit, have your form of payment ready for the remainder of your balance. If you are paying with cash, debit card or arriving with a $0 balance, we do ask for either a credit card imprint or a $100 cash deposit in the case of incidentals. Did you book under a certain special that will require an additional form of ID? Be sure to have that ready as well. This may include our Military Special for example, which requires that you provide one of the following: Current Military ID Card (active/reserve/retired), DD Form 214, Veterans Organization ID Card, VA Issued ID Card, State Driver’s License (if it shows proof of military service), VFW or American Legion Membership Card or other valid proofs of service. Check-in is at 4 p.m. If you arrive early you can pre-register and start using the amenities, but you won’t be able to get to your room until after 4 p.m. Don’t worry, we will call you when your room is ready. Enjoy splashing around the outdoor pool or bowling at our sixth floor bowling alley, Level Six! If you arrive early and want to use the swimming pools, you can easily change into your bathing suites in the restrooms located adjacent to our lobby. Additional restrooms are located by the indoor pool. It’s a good idea to pack a small bag that’s easy to reach (and not buried under piles of luggage in your trunk) with your pool essentials such as your family’s bathing suits, sunscreen and sun glasses. If you are arriving on a Friday, especially during the summer, expect that many other families will be trying to check in at the same time as you. Consider pre-registering, then relaxing by the pool or going out to dinner at Loco Gecko rather than checking in right at 4 p.m.
Due to limited parking, we can only distribute one parking pass per reservation. A $10 per night charge for overnight parking for 1 vehicle will be charged at check-in. We are happy to make recommendations on alternative parking options for any additional vehicles. You can see other parking tips here. If you haven’t already purchased breakfast ahead of time, be sure to do it at check-in so that you won’t have to worry about it later (or better yet, before you arrive). If you have a request, to be on a higher floor for example, it’s best to make this request prior to arrival. While we can’t guarantee requests, we do our best to honor them. If you have any questions for us about your stay, the resort, or about area attractions, don’t hesitate to ask as we are here to provide you with the best vacation experience possible! We cannot wait to see you and your family during your next stay at Captain’s Quarters Resort in Myrtle Beach. Still need to book your Myrtle Beach accommodations? Check out our handy guide to what you need to know when booking here.